This limestone residence was completed around 1909-1910 as the official residence of the Deputy Warden of K.P. It was built in conjunction with two houses once located behind it directly opposite the Prison for Women on Sir John A. Macdonald Boulevard, the site of which is now a lawn and parking lot. All three buildings, together with the limestone house next door on the corner of Alwington Ave., were used as government residences for Penitentiary Service Staff. From 1933 through the 1950s, this house was used as the official Warden’s residence for K.P. 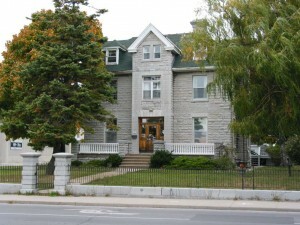 In 1990 this building was given a new purpose – to serve as a transitional residence for female offenders as part of a unique pre-release program. It was renamed after the first Superintendent of the Prison for Women, Isabel J. Macneill. The facility then operated as a minimum-security prison, offering job training, personal development programs and leisure activities designed to help inmates reintegrate into society when they are released. The facility could house approximately ten inmates at a time. Today when inmates are released they are able to draw upon support programs designed to assist them in reintegrating into society. Such programs are all relatively recent developments in the penal system. In the early years, when prisoners had completed their sentence they would be given a new suit, up to $10.00 in cash and a ticket to their hometown. Before leaving, the prisoner would also be given a ‘liberation interview’, usually conducted by the prison Chaplain or Warden. In this interview the prisoner would be asked about their personal history, the treatment they had received while at the penitentiary, and if there were any obvious weaknesses in security.